Users we have talked to are amazed at all the different things they can track with Goalposts. It was suggested to us, that we create a series of blog posts on the different ways the app can be used. We really liked the idea so here we go. I chose an exercise goal first because it seems that a lot of people these days are exercising and trying to maintain a healthy body. I love to exercise myself and know how easy it can be to get off track. I am also a bit of a competitor (even with myself), so when I look at the app I like to see that I am on track for the week. To begin, you will want to decide what you want your goal to be. 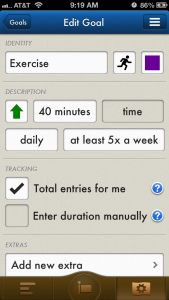 We will use my goal of at least 40 minutes a day, five times a week. You can also add any extras you might want. Just play around and see what works best for you. Remember, you can always edit and change your goal whenever you need to. This is just one example of how to use an “at least/up to” goal. I look forward to showing you the many other ways you can use Goalposts! 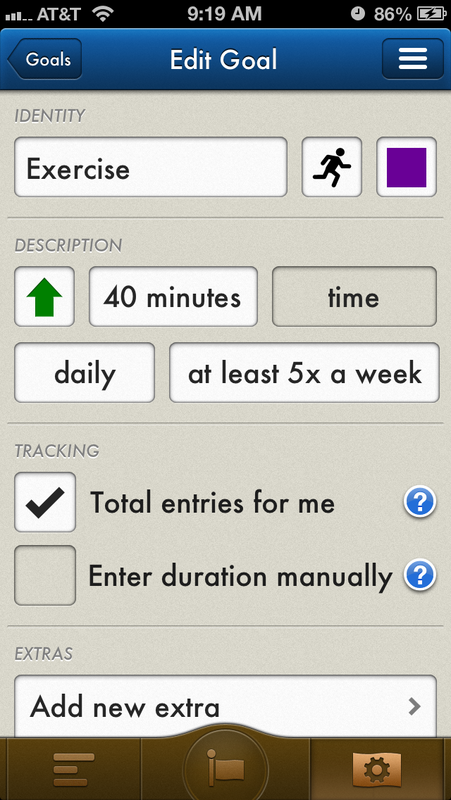 You will be surprised to see how I use the app to keep up with all I need to do. I would also like to hear from you! Please let us know some of the things you track. I bet there are many great ideas out there!